It’s a tough market to crack, being kosher and serving meat. As my friend Sophia says, “The Orthodox community in Atlanta isn’t wealthy. The Jews that are, don’t keep kosher.” Nonetheless people try. And on a day when I wasn’t sure where to eat, I wandered in through the back door of Moshe’s Mediterranean Cuisine and took a look around. I’m appreciative that we’ve had warm weather this late February. Otherwise I might not have seen the open back doors of this eatery, peered inside and become curious. They’re new to Atlanta, as the most I could find on the Internet about them initially was a blurb about them receiving their kosher designation. Being new, in all honesty, is perhaps the virtue that’s leading me to write about this place. Staff is still getting it all together, the place hasn’t built up a huge clientele yet. So, the staff will eat in their own place, and this staff is intelligent and talkative. Turn into the strip mall with this sign. 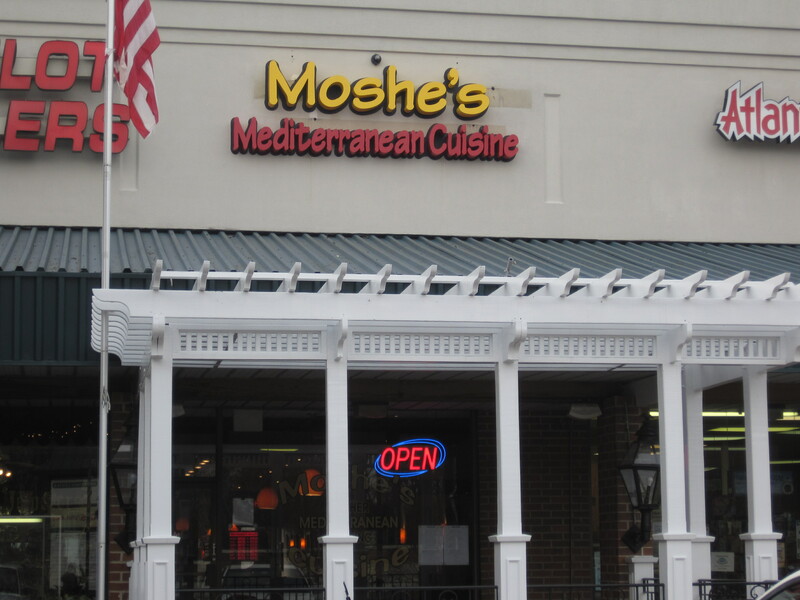 Moshe’s is a little past the corner of Mount Vernon and Jett Ferry Road. 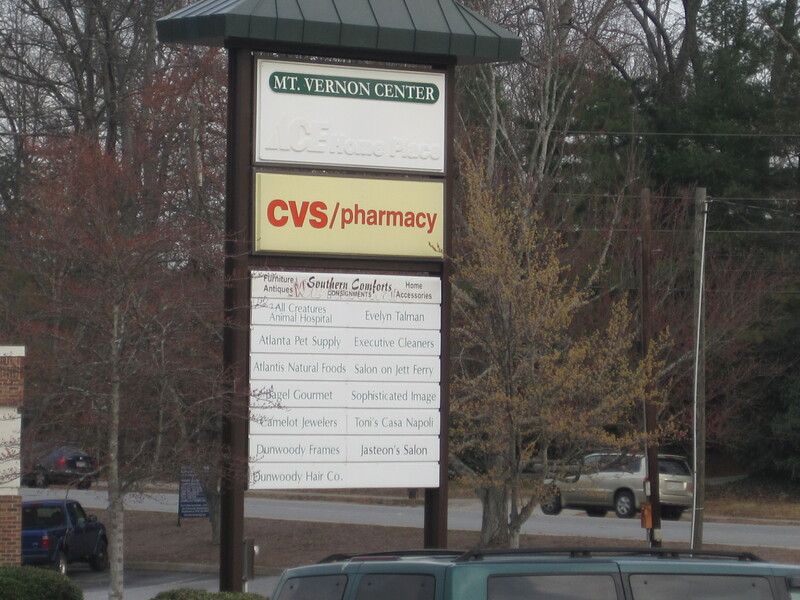 Head past the corner until you see the CVS sign on the left. Then turn. Moshe’s is small, not easy to see. It’s a much longer restaurant than it is wide, so the sign and frontage is easy to miss. It’s there, trust me. This day I had a salad and kabobs. They have a pretty extensive lunch menu, and prices at lunch are quite reasonable. They also offer schwarma, and they’re the closest restaurant to offer schwarma from where I work, along Peachtree Dunwoody. The bread for their sandwiches is cooked on site, and they have an oven, from Israel, in which they cook their pitas. I regret not having had some of their bread. I suspect that pitas and the schwarma here are going to eventually decide how well this restaurant is received. Just to note, staff routinely eat their own bread. There is some spice in those ground carrots. What I had was their pargiot kabobs and their cypress salad. 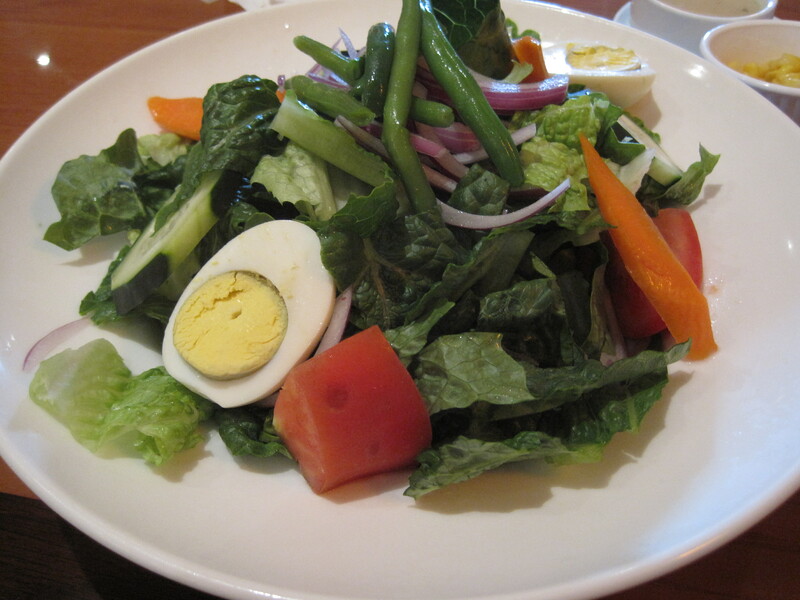 Salads here are huge, and filling. Dressing is citrus flavored, tasty. 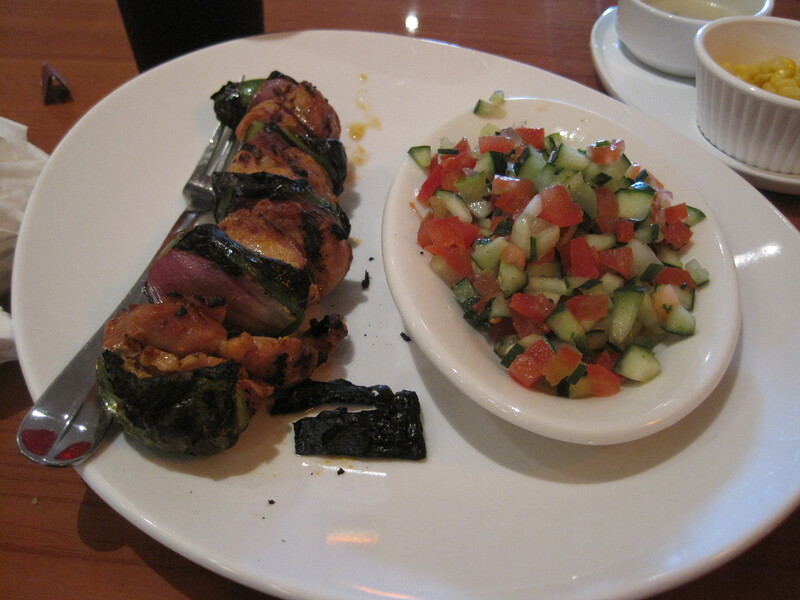 The kabob was good, though dark chicken meat is hardly my favorite on a kabob. When I come back, I’ll probably be trying beef. 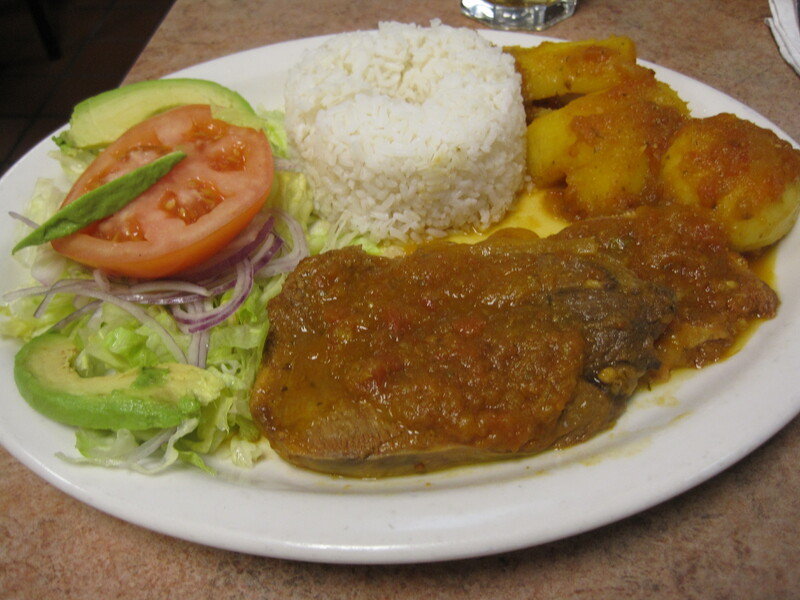 The best part of the meal was the engaging multicultural staff. They’re smart. They know food. I came in for a very late lunch and one of the chefs was out, eating, eating the bread they serve there. We shook hands and talked. Yeah, nice when you’re talking about food with a guy whose has forgotten more than you know, and introduces you to the rest of the staff. Right now, for a foodie, this kind of affability puts this place into the “off the charts” range for intangibles. It’s too soon to place any kind of final verdict on this restaurant. Pretty good? Good? Superb? Crawl on your hands and knees from Sprayberry, GA to get here? Hard to know. It is, however, very promising, especially for lunch, and for those of you who think Tony Bourdain is a little lightweight on his food talk, this place is a must visit, if you can catch staff feeling relaxed and talkative. 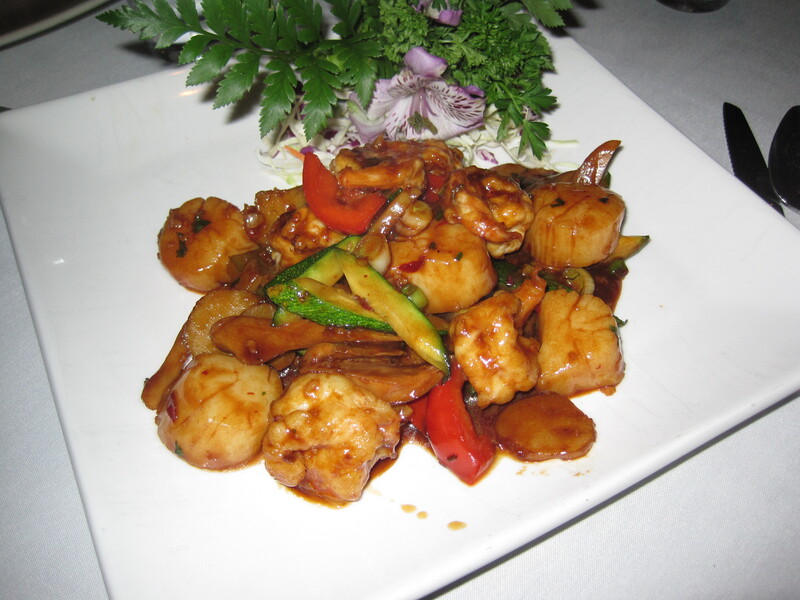 One of the more reliable restaurants near Snellville, I’m partial to Lavender Asian Bistro because of their efficient, responsive staff. 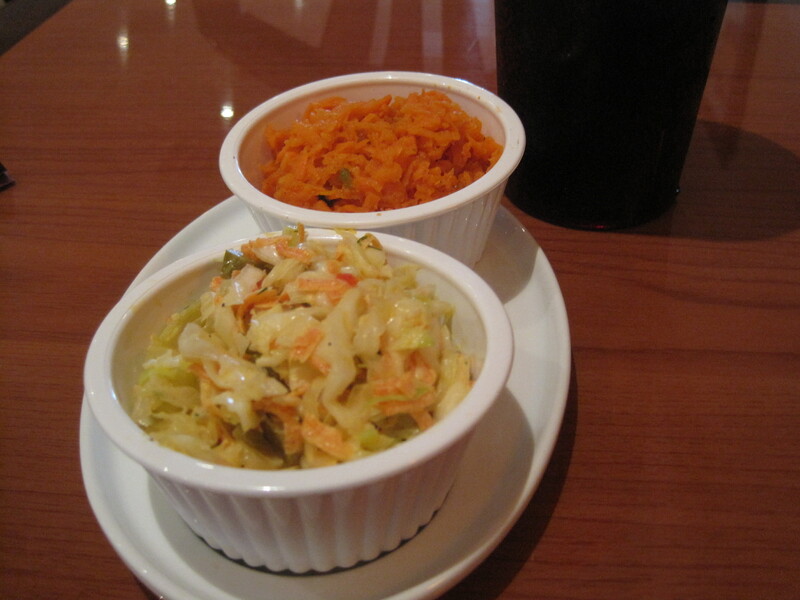 This dish is pretty good – fine ingredients – though this day it had neither the richness of garlic flavor nor the spice I prefer. One of the tricks when transplanting tomatoes is to bury part of the stem each time you do it. It keeps the plant from getting spindly and helps insure a solid root system. 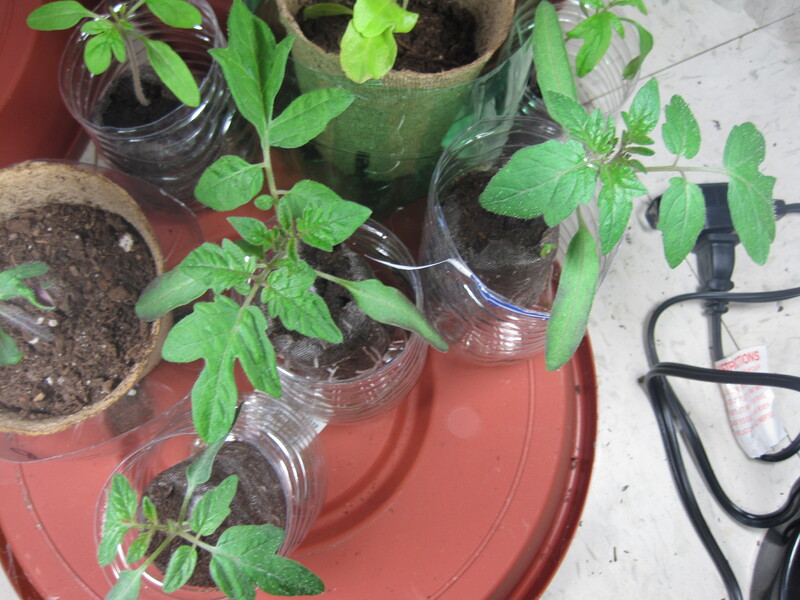 One of the things I’ve been trying is growing the tomatoes in the pellet (Jiffy 7s) longer than first emergence of the true leaves, so that I could push out the point at which I can bury the stem. The plants do not seem to have suffered from this treatment. Hearth Pizza Tavern, like any respectable pizza vendor in this town, has a good nose for bread. 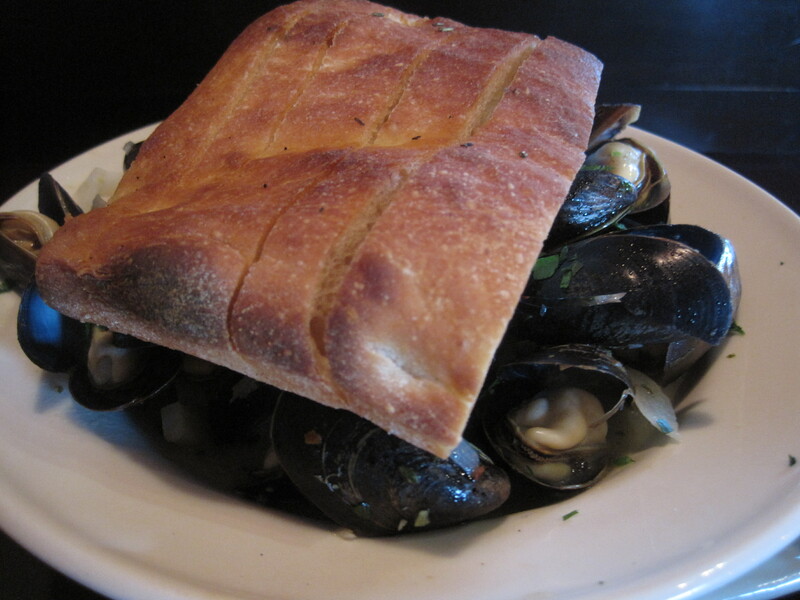 So when I ordered their mussels appetizer recently, they added a big chunk of good crusty bread with the shellfish. 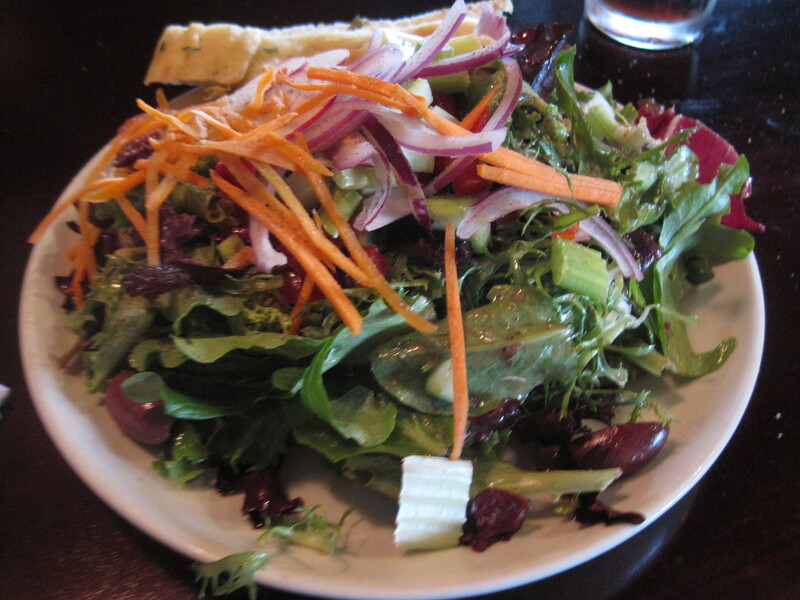 They also toss a pretty decent salad as well. The mussels come in a broth rich in garlic, onions, butter and white wine, perfect for dipping that bread in. Part of how this blog evolved was a product of what I could do. What I couldn’t do is out compete any professional in the depth of articles. I couldn’t go back to a restaurant multiple times, so the open source credo, “Publish early and often”, was the one thing I could do. As I obtained a better camera and started taking better photos, it became easier to get the good photo and let it carry more and more of the meaning in an article. My articles became shorter. My first sentences became more important, more crafted. I realized, finally, that consistent publication had a marked effect on my readership, about a 30% improvement when compared to publishing 1-2 times a week. As diabetes took over, shock changed to a kind of wary attitude towards food. I lost interest in bakeries, ramen, donuts. Not that I don’t remember them fondly, but I’m not reviewing pizza any more unless I get a guest eater involved. Places that serve burgers, sandwiches, hot dogs and kabobs have become a larger and larger focus of my interests. I managed to get my diabetes under control, but the tools I used.. well, they’re on my side bar now. I carry my camera always. It’s a discipline now, something I do. I feel naked unless I carry it. I tweet because I blog. I probably wouldn’t have tweeted otherwise. I worry a lot more about lighting. Lighting is the difference between a mediocre and a really good photo. I’ll sit with my eyes in the sun if that will get me the kinds of shadows that make for a good food photo. I think more about the joys of life. When it snows these days, I stop and take pictures. I look at pots of water, as they slowly heat, and think of the analogies between a heating pot of water and weather, under the effects of global warming. The atmosphere is an open thermodynamic systems whose physics are modeled by the set of equations studied by Edward Lorenz. The turbulence, the chaos in the system is powered by the energy input into the system, which, when it gets warmer, increases. This not only makes the average temperature warmer, it makes it more chaotic. The odds that the temperature no longer follows any routine pattern increases. 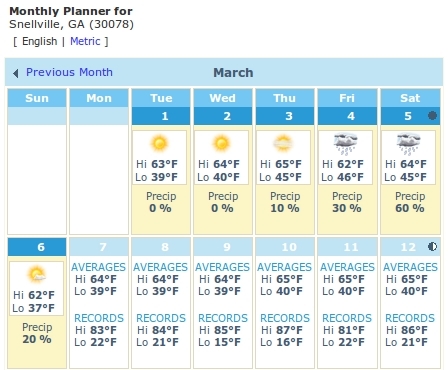 The odds that the once -60 degree arctic cold air mass (now a mere -58 degrees) ends up right atop Atlanta increases, because the system is more turbulent, more chaotic. It’s easy enough to model. Just heat that pot of water from below simmer to a rolling boil and watch. You can learn a lot cooking, gardening, and watching others cook. 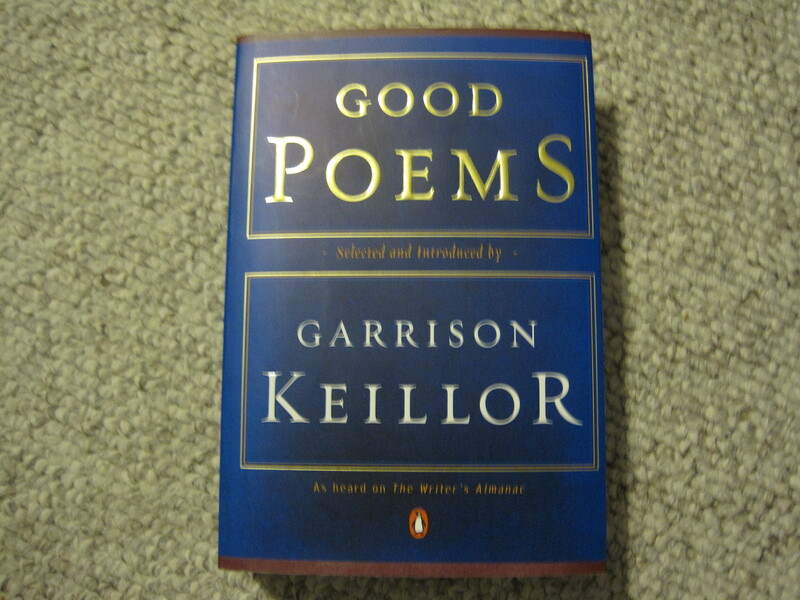 I read the Blissful Glutton these days looking at how she puts her opening sentences together. She can start with some appealing leads (examples here and here). After two years of doing this, I can now appreciate the emotions that went behind this review by Cliff Bostock. I’m proud of Gene, Jon, Jimmy and all those who have stepped out from blogs to more professional writing. I hope BuHi makes a fortune teaching people the cool places to eat in Inman Park. Foodie Buddha: don’t dare stop being the first to blog an opening. First Bite: get that degree! And the Ramen Girl: kinda cool, no? Three up and coming blogs to watch for: The Constant Gobbler, Marie Let’s Eat and Atlanta Food Critic. Hopefully they’ll benefit as much as I have from their new found hobby. Anyone I haven’t mentioned that I’ve spoken with, I hope you’ll understand. In summary, I’d rather eat than fight. I’d rather share a meal than argue politics. And whether you be Democrat, Republican, Socialist, Feudal Monarchist, or merely an anarcho-syndicalist being repressed by the system, if I’m at all lucky, perhaps I’ll share a meal with you some day.